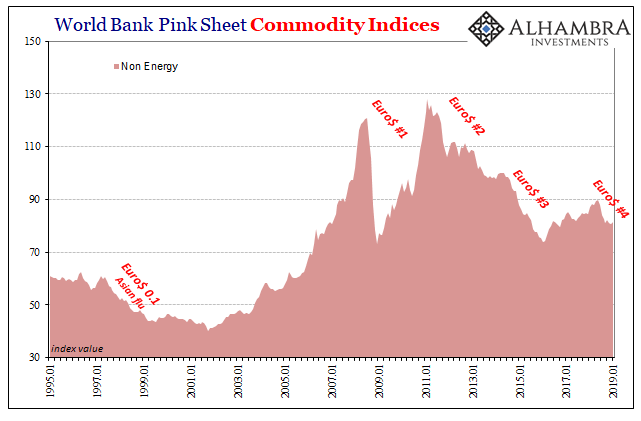 The last time they had fallen by that much it was May 2016.
Commodities are one key intersection between money and real economy. Both are forward-looking. Physical as well as monetary imbalances play off each other, performing checks on assumptions; are virtual money deficiencies “real” in the sense that perceptions about forward fundamental supply and demand are confirming? They don’t always have to agree even over the intermediate term. Periods of divergence can be just as informative. In the eurodollar sense, Reflation #3 begun in the latter half of 2016 was uninspiring. For the banks within it outside of Goldman Sachs and perhaps Deutsche Bank, they were overall uninspired. 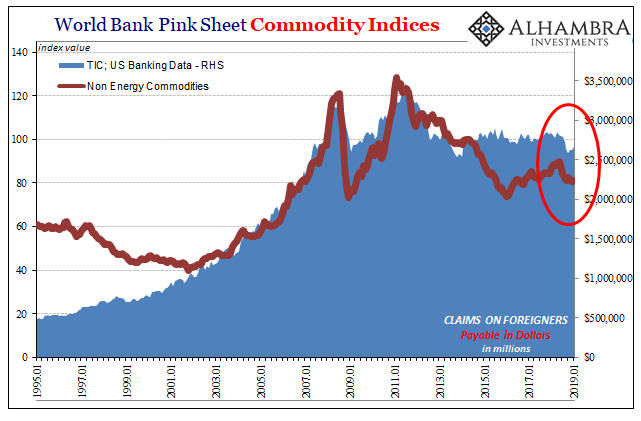 Yet, commodity prices seemed to be quite enthusiastic about economic opportunities under what would later be called globally synchronized growth. That narrative, nothing more than a marketing slogan, seemed to have more of an effect in these markets compared to the monetary system. Odd, to say the least. More and more it seems a head fake, one centered, I believe, on China and RMB. The eurodollar world stumbled out of Euro$ #3 and never really regained much momentum. That meant the Chinese system would not recuperate much of its lost monetary base – “dollars” in the form of foreign reserves. There was a conscious decision at the outset of 2016 whereby the PBOC would fill in the gap by printing RMB through its own discretionary balance sheet activities. Forex assets might still fall, and they did, but Chinese money wouldn’t as the balance tipped more toward “unbacked” RMB. 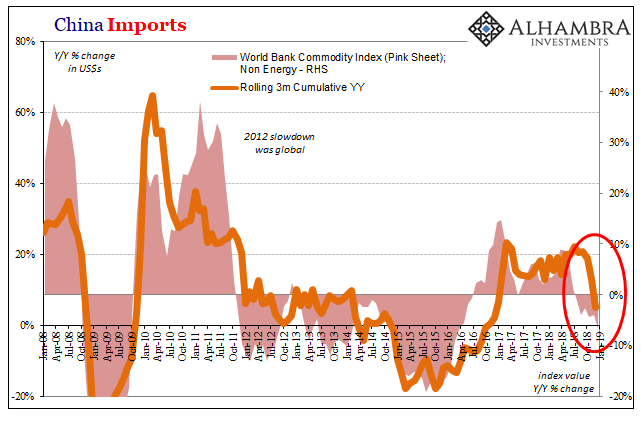 Commodities even China’s economy seemed revived by the prospects. It was anticipated to be the biggest decoupling attempt yet; if the eurodollar world wouldn’t completely heal itself, then the PBOC might just go its own way for the first time ever. Perhaps this is what brought European banks a little way back into the eurodollar world for the first time in many, many years.